The Description was invented so people know what they're downloading, so I will not answer any questions to people who have obviously not read it and then spam the comments! Thank you. I've seen a lot of people asking how to set up a server lately. That's why I decided to create a program that helps people to create server in a much easier fashion. The QuickClick Server Creator will Download the latest CraftBukkit Build and create a simple Bukkit Server without any Plugins. Also, it offers a clean User Interface to customize the Server Settings, and it has a comprehensive help section that explains every single option. THE SERVER CREATOR DOES NOT PORT FORWARD FOR YOU! To do so, look at other tutorials, I don't offer any support for that. I am not responsible for any problems or casualties that the server may have/cause. Also, I do not offer any support for the server itself, only for the program. For information on the server, go to www.bukkit.org. I do not own the plugins available for download in the Server Creator and I do not distribute them. The QuickClick Server Creator is distributed as is, and I will not guarantee that it always works correctly. Usage on your own risk! If you do run into a problem with the program that is NOT explained in the help files, feel free to post it in the comments. 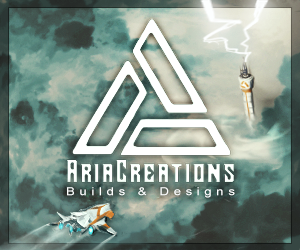 The Server Creator requires an internet connection! If you aren't connected to the internet and started it already, connect to the internet, restart the program and try again! If the .bat only says "Press any Key to continue...", open the folder dist and start the Server Creator.exe. if that doesn't work either, open the TaskManager, go to processes, end the process "Server Creator.exe" and try again. The newer versions will be in a different format, as a single .exe! The software is available as-is. I don't guarantee that it works for everyone, but if anybody really read this, they'd already know that, and used the Alternative Installation. Please, stop spamming the comments about that. I don't know why some AntiVirus Programs are detecting a virus in this! Also, I have put the source code online for everyone to look at, if you know just a little bit about programming, you'll see it's not a Virus. I just uploaded a tar.gz to MediaFire. It contains a linux-compatible version of the ServerCreator. I had to remove a few functions because they were not compatible with Linux Shell commands and I will have to port every new version to Linux once I have the Windows version. This is a lot of work and it will take some time, so please don't spam the comments because something doesn't do what it's meant to do. That does NOT help! Also: I will now start filming a tutorial on how to set the Server Creator up on Windows with Python if the Executables don't work. EDIT: I don't what stupid little flamer flagged this, but better he'd better hope I don't find out who it was -.-'' This is supposed to help noobs like him set up a server, and what do I get in return?! I am thinking of adding some standard plugins into the download function so you can choose between 3-5 plugins if you want them installed. For that, I will have to talk to the plugin creators and it'll be a lot of fuzz, so this is a plan for later on, not right now. Also, I want to make the source code platform independent, so I'll have to work through all of it again. Version 1.3 out now! It adds lots of new features to the program. Since many people have problems with executing the Server Creator: This is a way that will always work! Second Step: Download the source files. For this, click the File Mirror Download Link, then open the folder "source" in the MediaFire repository. Get both files in there, then copy them into any folder. Third Step: Start the Server Creator. Just double-click the Server Creator.py to start it! Thank you if you actually read this without posting stupid comments and having me bang my head on my desk. Just download and unzip the latest version. Can u make any ip u want? Can everyone in the world join it? Is this for 1.7 or 1.6? And is it for 1.6.2? Can you download any plugin you want to this? Yes, but the plugins not available within the program itself have to be installed manually. Psh. Port forwarding is EASY. Hey there, i am using linux and i don't know how to install it, because I just started with Linux can u by any chance help? Ugh. Can't download it thanks to mediafire being greedy. Can you put it into a zip file? Is this Compatible with 1.4.7? I'm using a different way , but it consists of viruses. ARGH. I hope you don't mind if i block you, I have other things to do than putting up with ignorant people like you. 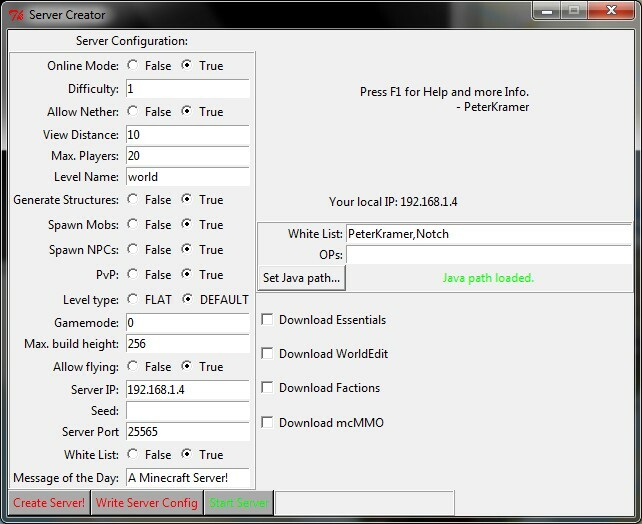 Peter, every time I open Server Creator.py it goes to a download thing and then it juuust opens up a block box for half a second then it goes off. I don't know what to do!!! Help! If you would have read my last reply instead of deleting your comment you would have known that the program is OUTDATED. Plz tell me that it works for Mac. it downloads the latest recommended build, should auto-update. Can you get hacked if you have a server? you can always get hacked if you're connected to the internet. If you made it auto port forward, i would kiss you somehow. Ya, but i took it of the site, i probably shouldn't have, though. It is a good plugin :3, I am co owner of a Minigame server with that plugin. Does it work with 1.3.2? It says press any key, i click a key, and it closes. Petrt How Do You Downgrade? Ooooh - I get it. You mean your Minecraft version, right? The Bukkit team may not have updated CraftBukkit yet, so it won't work with 1.3.1 Clients. To protect your pc, it has something like a big wall around it, the FireWall. Imagine a Wall with lots and lots of doors in it. Your Firewall decides whether a door is open or closed and what program can use which door. Those doors are ports. you forgot to unzip the file. do u have to have hamachi? this program will only create the type of server you can download. how to do that with windows 7? after extracting all files, just start the "Server Creator.bat". I got the "Windows" one and sownloaded. it came up in my 7Zip and I clicked on server creator underneath Bin. It then said The sytem cannot find the path specified. Click any key to continue, and when I click a key, it turns it off. why? you need to extract all files first.